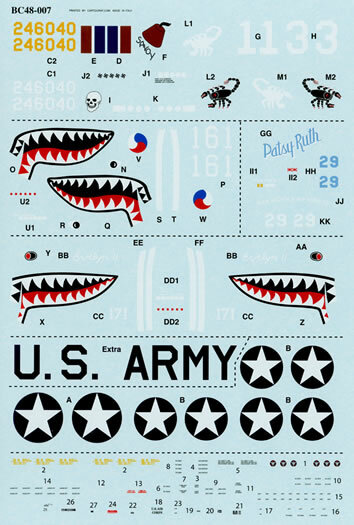 BC48007 is the final of the new 1/48 scale P-40 sheets in the latest series of releases from Roy Sutherland’s BarracudaCals decal company. It appears that Roy is working his way upwards through the P-40 series having moved on from the P–40E. 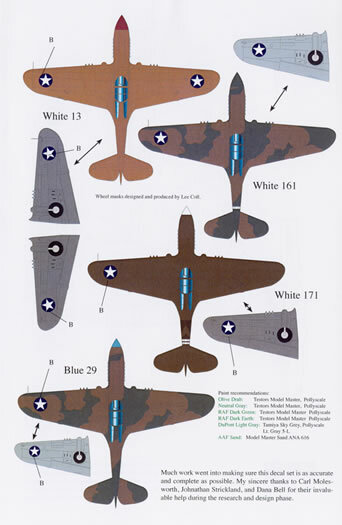 This sheet provides markings for four Curtiss P-40K Warhawks. 42-46040, plane in squadron number 13 flown by First Lieutenant Robert Johnson ‘Jay’ Overcash of the 64th Fighter Squadron 57th Fighter Group from Hadi Main, Tunisia in the May of 1943. The aircraft is in “Army Air Forces sand” over neutral grey with a red spinner. It wears a series of artwork, with its rudder sporting (what looks to be) a fez and the word ‘SAVOY’, a skull beneath the cockpit and a scorpion on both sides of its intakes. It also wears its serial number on an olive drab back ground – a white and a yellow decal is provided for the serial to guard against any bleed through of the olive drab, and RAF fin flash, kill markings under the cockpit. National insignia is of the early star on a blue circle background (as are all options on this sheet). ‘Evelyn’, plane in squadron number 171 flown by Major Elmer Richardson of the 75th Fighter Squadron 23rd Fighter Group from Hengyang, China in late 1943. The aircraft is in a faded olive drab over neutral grey camouflage scheme with fresh (and darker) olive drab areas on the rear fuselage, fin and rudder. The spinner is part white and part olive drab and it sports both a shark mouth on its nose and twin white bands around its rear fuselage. The plane in squadron number 171 is worn on the fin and five ‘kill’ markings are worn under the cockpit. ‘Patsy Ruth’, Plane in squadron number 29 of the 7th Fighter Squadron 49th Fighter Group; Flown by Second Lieutenant Arland Stanton from the 30 mile drome, Port Moresby, New Guinea in March 1943. The machine is in the Curtiss factory dark green dark earth over light grey scheme with a blue tip to its spinner. It has a blue plane in squadron 29 in blue on its intake and in white on the fin. The name ‘Patsy Ruth’ is in light blue with a white surround. It also wears the words ‘Nick Nicholl’s Nip Nippers’ on the cowling above the exhaust stacks in white. This name arose from the fact that the aircraft was a part of the 7th Fighter Squadrons red flight which was led by a Captain Frank Nicholls. A pair of ‘kill’ markings and the pilots name round out the markings. The decals themselves have been printed by Cartograf. They are thin, in perfect register- even the tiny Curtiss propeller logs – and have an absolute minimum of film surrounding each subject. You get two sets of stencil data with the sheet. 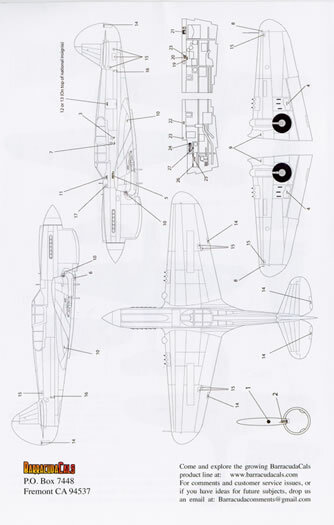 The stencil data is very comprehensive indeed and even extends to the provision of the data plates for the inside of the cockpit. The placement guide is A-4 in size and folded in half so as you get four pages of information. Each option is illustrated in full colour with a left hand side profile and an upper surface plan view. 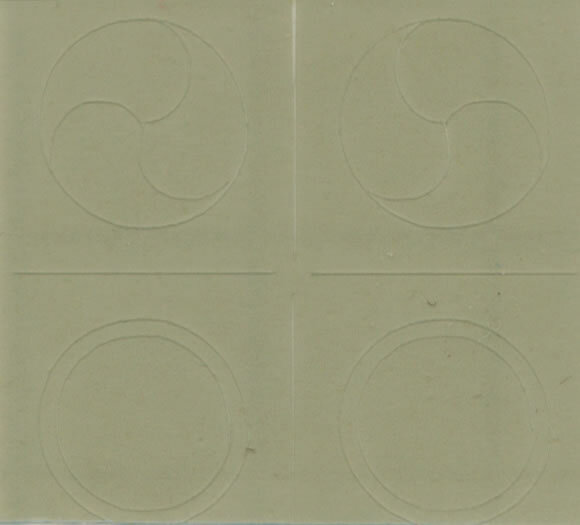 You also get a four view black and white line drawing to show the stencil placement. The decals, the tiny vinyl masks and the placement guide come packed in the industry standard clear plastic zip-loc bag. 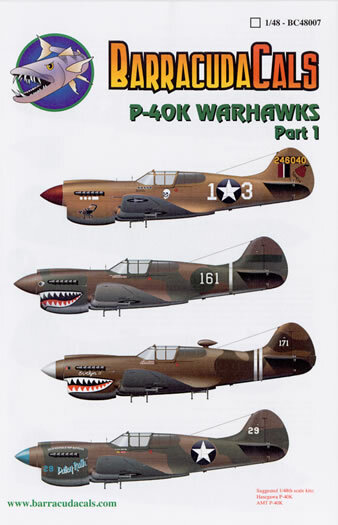 The suggested kits are the Hasegawa and AMT P-40K ones. An excellent sheet from BarracudaCals. 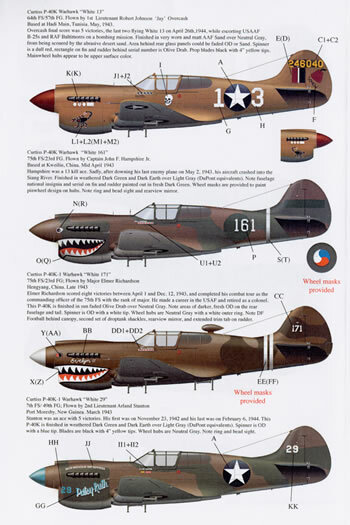 It provides you with first rate decals and support materials to enable you to accurately model some early war P-40Ks.